University of Georgia Press, 9780820328355, 72pp. After he was handed an old broken-down bamboo fly rod, Frank Soos waited several years before he cautiously undertook its restoration. That painstaking enterprise becomes the central metaphor and the unifying theme for the captivating personal essays presented here. With sly wit and disarming candor, Soos recounts fly-fishing adventures that become points of departure for wide-ranging ruminations on the larger questions that haunt him. Coming to terms with his new rod in "On Wanting Everything," Soos casts a skeptical eye on the engines of consumerism and muses on the paradox of how a fishing rod that becomes too valuable ceases to be useful. "The Age of Imperfection" begins as a rueful account of his botched repair work but soon changes into an insightful reflection on the seductiveness of perfection and finishes as an homage to the creative power that comes from mistakes. In "Useful Tools" Soos takes a decidedly pessimistic look at the age-old quest to combine the good with the beautiful and concludes with an eloquent appreciation of a good tool put to an unintended use. "On His Slowness" offers fresh new perceptions about the human costs of the ever-accelerating pace of contemporary life and the increasingly hard work of resisting it. More than a meditation on suicide, "Obituary with Bamboo Fly Rod" engages the issue of individual human responsibility and the ultimate question of "How to be" with equal parts humility and wonder. This elegant volume is handsomely illustrated with the full-color paintings of Alaskan artist Kesler Woodward. 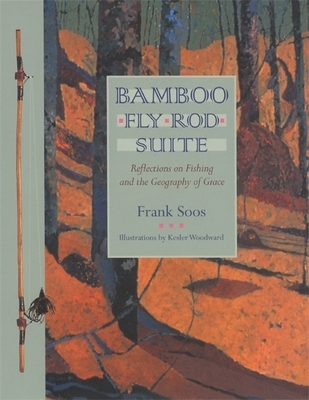 Rich in wisdom and physical appeal, Bamboo Fly Rod Suite is a distinctive and rewarding book with wide-ranging appeal. Frank Soos, a native of Virginia, is the author of "Unified Field Theory," which won the Flannery O'Connor Award for Short Fiction. He is a professor emeritus of English at the University of Alaska in Fairbanks.